The frame is made up of corrosion-resistant, the lightweight aluminium frame safely supports up to 250 pounds. It has got better for stable mobility. The height if the handles are adjustable to every individuals comfort. The system can be folded conveniently for compact storage and transportation. Padded and height adjustable armrests for better support. The handles can make transition between sitting and standing a lot easily and safely. Easily foldable and lightweight for transporting. Build so comfortably that it reduces stress and pain on wrists, back and joints and legs. The seats are movable and comfortable. Multi-Terrain 8-inch rubber wheels help to move smoothly over bumps and uneven surfaces. Rollator – It is build-up of corrosion-resistant, lightweight aluminium frame. There are a few parts (wheels etc.) made from fiber reinforced plastic and all axles appear to be made from stainless or high strength steel. Upwalker – The sturdy frame is made from aluminium alloy and other quality materials including composite plastic and polyurethane. Wheels are made up of soft high-quality TPR rubber (not inflated) whereas material used for the handles is foam polyurethane. Rollator – Insert front wheels into the frame. Attach storage bag to the frame with the fastener loops. Upwalker – Arrives fully assembled – no assembly required. Rollator – The seat is lightweight, strong and durable made up of mesh material but they are not padded though said to provide required comfort. There is a flat strip in the middle of the seat that is the activator for folding the walker up. Upwalker has comfortable fabric seat with backrest support. You are also able to slides seat front to back for sitting or walking. 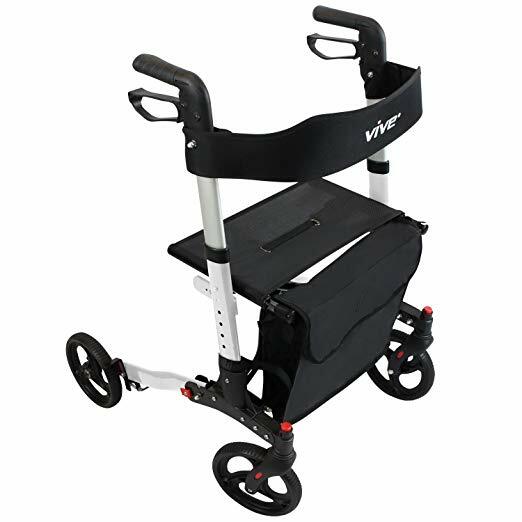 Rollator – It features sturdy backrest for comfort and security. Upwalker – It has comfortable backrest. Rollator & Upwalker – Yes. Rollator features dual braking system that can be locked when you do not want the walker to roll. Upwalker comes with easy to use braking system that has better control over stopping and parking. They function independently, brake only one wheel each, and includes parking brakes. Rollator – Adjustable Height: 31” to 36”. Upwalker has adjustable-height armrests that adjusts the height independently of each other. Rollator – The push pins located on the sides of the Rollator helps you adjust the handle height by 1” increment. Upwalker – The armrests extends or shortens to adjust according to the length of your forearm while handhold helps to easily pivot for optimal wrist position. Rollator – Seat Height: 24” Seat Depth: 7.85” Folded Width: 10.8”. Upwalker – 20 inches from the ground. Rollator – Base when open: 25” by 28. Folded: 10” by 20” by 32”. Upwalker – Upwalker is 23.5 inches wide and goes through most doorways. Folded: 34 inches long x 8.5 inches wide x 37.5 inches high. Upwalker – Up to 300 pounds. Rollator and Upwalker – None. The unit is quite bulk, may be because the rear wheels extend further apart than the front. If we thought about this design from a point of older people, it is hard to lift the unit to swing the rear wheels into the body because of the weight of the unit. It also has ribbed tires that are great outside, but hard to push on carpet or through doorways. The storage bag does not have enough space as originally perceived. In addition, the stitching of the bag is cheap and not very well attached as expected. Another problem is that the instructions are weak. Directional colour codes missing from the Rollator not corresponding to instruction booklet eg. red quoted but black button on item. This model is designed beautifully and engineered well for the shorter person. It does reduce the pain in the shoulders. But the problem with Upwalker is that it is too bulky and big for maneuvering in the tight spaces. Also, the size makes it not best choice for use in the house. Not recommended to use it for walking on the yard. For complete UpWalker review, please visit this page. 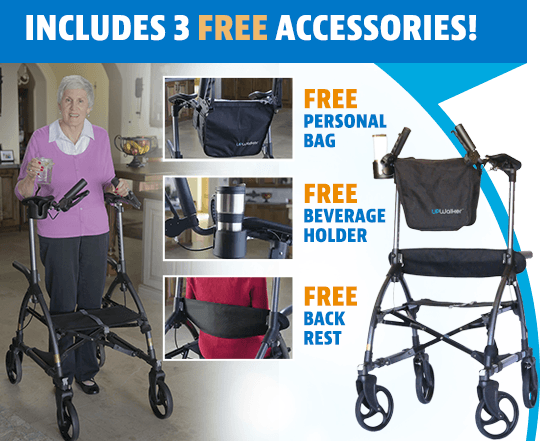 Be the first to comment on "Rollator vs Upwalker | Compare As Seen On TV Walkers"